The female staredown is back. Sultry, mesmerising, threatening, inscrutable, hungry: women giving good eye on screen literally inspires how we mirror emotion and communicate, whether through gif or IRL. The ferocious women of Kill Bill taught us that killer looks can prove fatal, Lauren Bacall pioneered the no-nonsense side-eye, and Rooney Mara’s Lisbeth Salander made the chilling stare of a sniper seem chic. These steely-eyed women have a new little sister-in-arms: Eleven, the enigmatic, Eggo-pilfering, telekinetic dynamo from Stranger Things. Portrayed by newcomer Millie Bobby Brown, her stare is genuinely enthralling, paralysing monsters – and boys – in their tracks. She reminds you of Natalie Portman in Leon or V for Vendetta – or a young Winona Ryder, with whom Brown stars in the series. She carries the onscreen gravitas of a future Oscar-winner, and the doe-eyed, gamine appeal of a budding fashion darling. Before we go any further, please note: she is 12 years old. It’s a muggy day in Brooklyn when I’m confronted by that stare in person. Brown sits as serene as a statue on a stool, having her hair and make-up done. “Hi,” she says, sounding a bit subdued when greeted, and flashes a quick smile. I consider for a second what it’s like being 12 and surrounded constantly by adults, and wonder if she is simply having a shy spell. Sure enough, once set free of the chair, she explodes wide-open with personality; within minutes, we’re discussing how mental it is that she just met Barack Obama. She sets the scene of her acting origin story with charming modesty. “I was bored one day, so my dad took me to this acting school. I liked it more than having fun – I liked it for an actual job,” she says, citing her British-born family’s stint in Florida. Sixty bucks later, she dragged her dad to meet with an agent. “The agent was like, ‘You need to go to LA.’ So I said to my dad and my whole family, ‘Can we move to LA?’ They were like, ‘Sure!’” she says, innocently describing what seems like the most ludicrously drama-free cross-continental move in history. Brown is nothing if not gracious, crediting the show’s female-positive feel to her other co-stars, too. “Winona is also a heroine in the show – and Natalia (Dyer, who plays Nancy Wheeler). We’re all just in a different age range, but it’s cool to have female heroines.” Ah, yes: Ryder, elusive though she is in person, exerts a huge influence over the programme and its young cast. In fact, it’s her presence that brings the show’s 80s world-building blissfully full- circle – bring up her name, and Brown lights up. 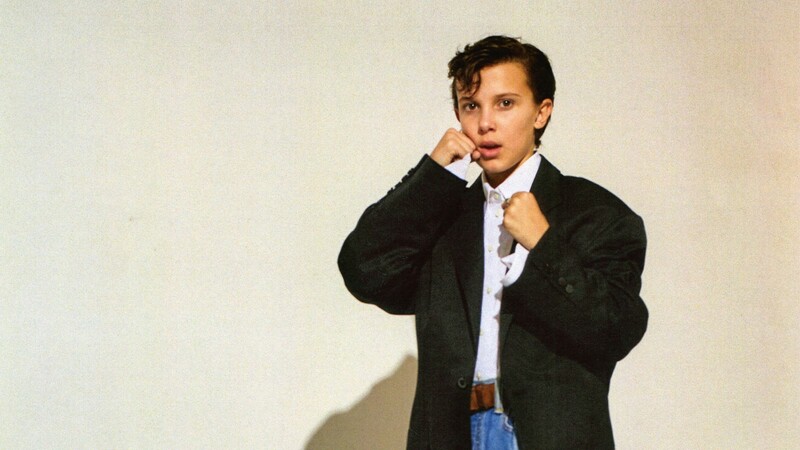 I ask what she’d want to tell Eleven, who has become so synonymous with herself. “Don’t give up, that’s it. She’s always trying to give up, but she can’t. But maybe one day she will! You never know.” She lets the suspense hang in the air. Unsurprisingly, she cannot comment on Eleven’s fate, or if she’ll return to the show. “I don’t know, I have no clue,” she says in a singsong voice when I ask if she has any travel plans coming up (Editor’s note: since the time of going to print, Brown’s return to the show has happily been confirmed).